Power through your day with the non-drowsy, multi-symptom cold and flu relief of Vicks DayQuil Cold & Flu Multi-Symptom Relief Liquid. For cough due to minor throat and bronchial irritation, sore throat, headache, minor aches and pains, fever and nasal congestion. Turn to NyQuil Cold & Flu Nighttime Relief Liquid to relieve your cough due to minor throat and bronchial irritation, sore throat, headache, minor aches and pains, fever, runny nose, and sneezing, so you can get the sleep you need. With a Vicks® NyQuil® / DayQuil® Liquid cold treatment combo pack, you'll have the cold relief you need on hand, day and night. DayQuil Cold & Flu Multi-Symptom Relief Liquid: Active Ingredient: Acetaminophen 325 mg (Pain reliever/fever reducer), Dextromethorphan HBr 10 mg (Cough suppressant), Phenylephrine HCl 5 mg (Nasal decongestant) Inactive: Carboxymethylcellulose Sodium, Citric Acid, Disodium EDTA, FD&C Yellow No. 6, Flavor, Glycerin, Propylene Glycol, Purified water, Saccharin Sodium, Sodium Benzoate, Sodium Chloride, Sodium Citrate, Sorbitol, Sucralose. Each tablespoon contains 50 mg sodium. 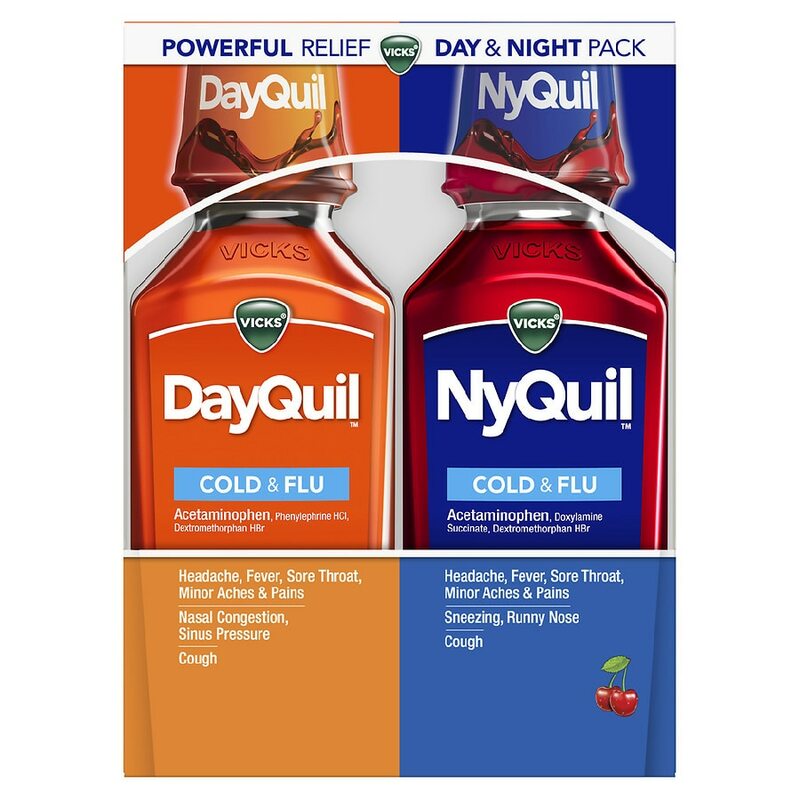 NyQuil Cold & Flu Nighttime Relief Liquid Cherry Flavor: Active Ingredient: Acetaminophen 325 mg (Pain reliever/fever reducer), Dextromethorphan HBr 15 mg (Cough suppressant) Doxylamine succinate 6.25 mg (Antihistamine) Inactive: Acesulfame Potassium, Alcohol, Citric Acid, FD&C Blue No. 1, FD&C Red No. 40, flavor, High Fructose Corn Syrup, Polyethylene Glycol, Propylene Glycol, Purified Water, Saccharin Sodium, Sodium Citrate. Each tablespoon contains 5 mg potassium and 19 mg sodium. Keep out of reach of children. Overdose warning: Taking more than directed can cause serious health problems. In case of overdose, get medical help or contact a Poison Control Center right away. Quick medical attention is critical for adults & for children even if you do not notice any signs or symptoms.